This flyer is making the rounds of the west side neighborhoods abutting Bronson Avenue. The above photoshopped illustration shows just ONE potential way to improve Bronson so that it meets the needs of pedestrians, cyclists, transit users, adjacent businesses and residents, as well as motorists and commuters. There are alternative ways to improve Bronson so that it makes more people happy. Anyone who travels on or across that blighted street knows that the 1950′s thinking that gave us the current “four lane” urban arterial didn’t work. Yet Ottawa seems on the way to fifty more years of a disfunctional road and urban blight. There are other ways to design streets, better ways. 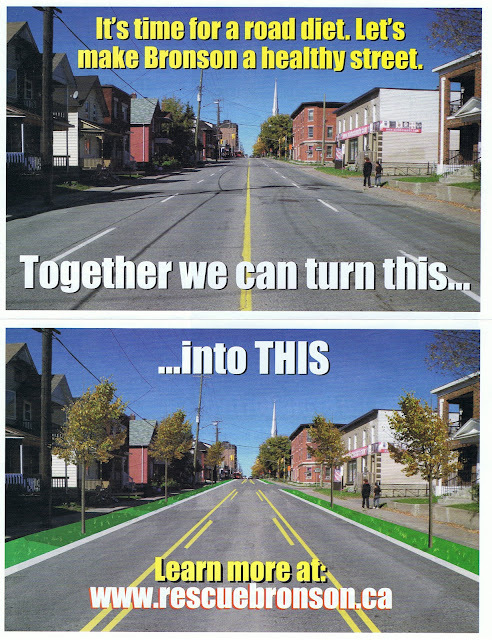 Other cities all across North America are implementing “road diets” aimed at four lane urban arterials. They have had great success in implementing roads that make motorists and adjacent neighborhoods happier and safer places. Ottawa is late to this strategy, and has had to be dragged in kicking and screaming. Too many traffic engineers have a one size fits all solution: widen it. It has a name: commuter first planning. But why do commuters from Greely or Pointe Gatineau get catered to while whole city neighborhoods get cratered? Local community associations and Councillor Holmes are having a public meeting on Wed. Nov 10th at McNabb on Percy Street at 7pm. There will be a brief presentation on road diets. Then discussion. There will not be a presentation by traffic engineers. Bronson can be made better. The awful Albert/Slater/Bronson intersection can be improved. Be sure to come out to express your views. 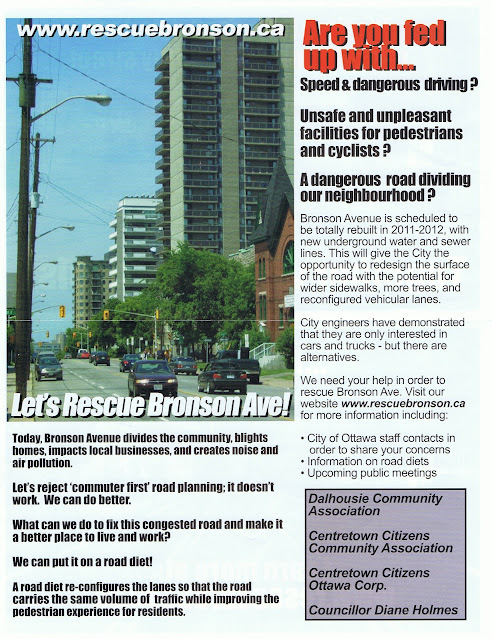 And sign the petition at www.RescueBronson.ca.